For most of my life, I really didn’t like sweet potatoes. I always chose white baked potatoes with cheese & sour cream over baked sweet potatoes with butter & brown sugar. At Thanksgiving, I’d maybe nibble on the crumbly topping of the sweet potato casserole, but I wouldn’t touch the mashed sweet potatoes. Well, it turns out that it wasn’t sweet potatoes I didn’t like. It was sweet sweet potatoes I didn’t like. Turns out, I actually love savory sweet potatoes, whether they’re chopped & oven-roasted with garlic and black pepper, diced & cooked in a skillet for breakfast, or baked whole and loaded with savory toppings. As the girl with the the biggest sweet tooth around, it made no sense. These days, sweet potatoes are one of my favorite foods. Mostly if they’re savory, but I’ve actually grown to enjoy them either way now and they’re a staple in my dorm pantry. 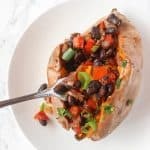 I came up with the idea for these easy stuffed sweet potatoes since I’ll sometimes make just a sweet potato for dinner. If I had more time/was cooking for more people/didn’t live in a college dorm, I’d probably make something like grilled chicken to go along with it for some protein since a lone sweet potato isn’t much of a meal. But since all three of those things do apply to me, I devised a super fast (we’re talking 5 extra minutes) way to jazz up basic sweet potatoes and create a really delicious, easy vegetarian meal. It requires just one bowl, one spoon, and one pan, and makes enough food for a few meals of leftovers. First, put three large or 4 small sweet potatoes in the oven on one side of a baking sheet. Poke a few times with a fork and bake until they’re close to being done, but not quite ready. (I used two large so I had leftover filling.) Parchment paper makes clean-up easier. 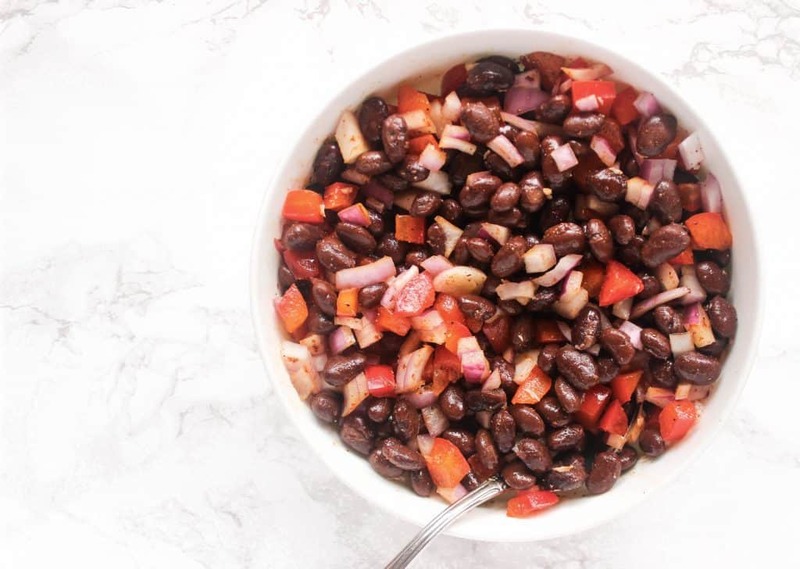 While the sweet potatoes are baking, chop a bell pepper & a red onion and drain, rinse, and dry a can of black beans. Add lots of seasonings. 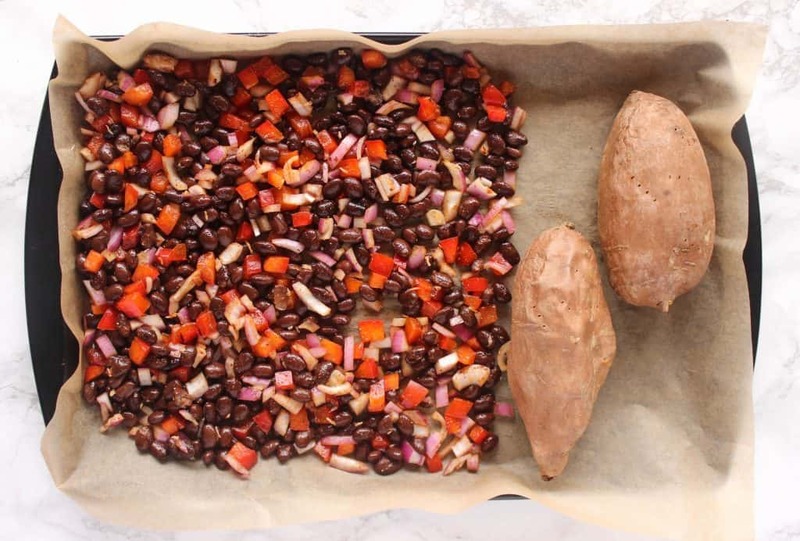 When sweet potatoes are close to being ready but not quite there yet, add the black bean mixture to the other side of the baking sheet. Return the pan to the oven and bake until sweet potatoes are done and black bean mixture is starting to crisp. Carefully make a shallow vertical cut in each sweet potato and stuff with black bean mixture. Add your favorite toppings like green onions, sour cream, cheese, etc. and enjoy your stuffed sweet potatoes! If you try out these stuffed sweet potatoes, feel free to let me know in a comment or take a picture and tag me @livbane on Instagram. Hope you enjoy! Preheat oven to 400 degrees. Scrub sweet potatoes clean and dry the skin, poking each one a few times with a fork. Place sweet potatoes on one side of a baking sheet lined with parchment paper and put in oven for 50 minutes. 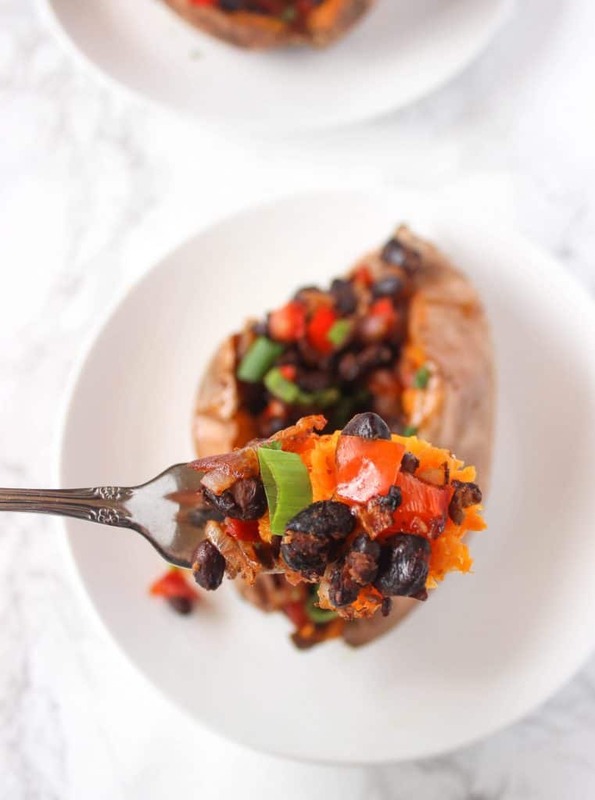 While sweet potatoes are baking, mix together black beans, diced bell pepper, red onion, chili powder or cayenne pepper, salt, and black pepper. 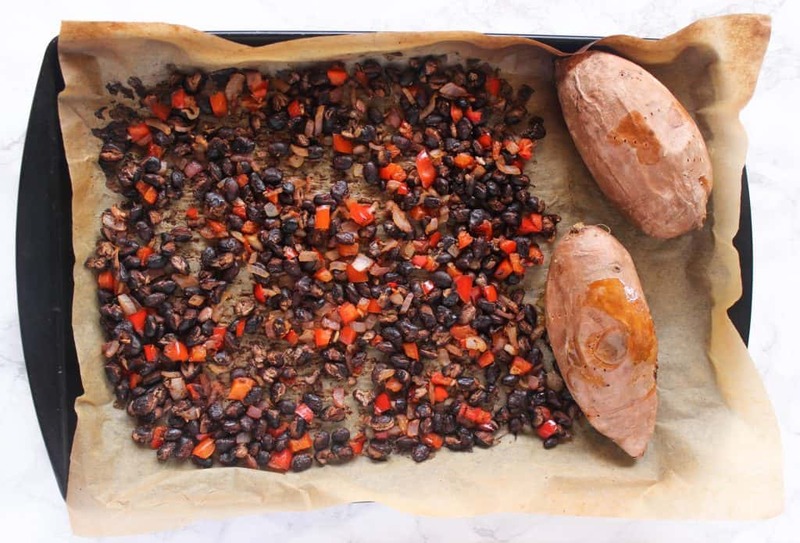 After 50 minutes, pull sweet potatoes out of the oven and add black bean mixture to the other side of the baking sheet. Return to oven for another 20 minutes, or until black beans are crispy and sweet potatoes are done (when a fork can be easily pushed through the middle of the sweet potato). Make a shallow, vertical cut down the length of each sweet potato. (Don't slice all the way through it.) 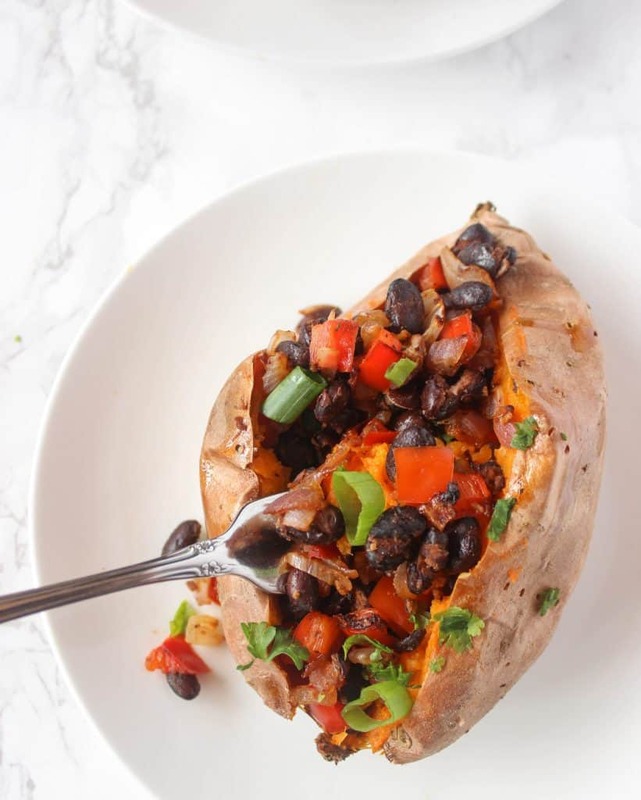 Fill each potato with black bean mixture and desired toppings and enjoy immediately. The filling makes enough for 3 large or 4 small sweet potatoes. I used 2 large, so I had leftover filling and I added it to a salad another day. Do you prefer sweet or savory sweet potatoes? Have you ever made stuffed sweet potatoes? Do you have any foods you used to hate but love now? This is such a good idea liv! Sweet potatoes are a dorm room staple for me as well. I usually just top them with nut butter, but I really want to try this! I’ve never tried nut butter on a sweet potato but will have to give it a try sometime because I’ve heard people talk about doing that. I don’t think I could do the PB & sweet potato combo, but maybe almond butter? Sounds like an easy meal, especially when served with chicken or veal. It is amazing that you can cook all you are when living in a dorm room. A salad would be a good beginner for this feast! I can’t handle anything really spicy either- just enough spice to be delicious/not bland! How about your cooking some for Thanksgiving? Would be an interesting change. Girl you and I are the SAME. I used to hate sweet potatoes, but thats because my only experience with them was at Thanksgiving when they were smothered in sugar and marshmallows. Dipped in ketchup or stuffed with chili though? GIMME!! AH yes, that’s exactly how I feel! I don’t like overly sweet sweet potatoes (think sweet potato casserole), but I do eat them in sweet contexts. I’ve had cinnamon-sugar sweet potato fries that were amazing and I regularly stuff my sweet potatoes with nut butter, but I also love them in savory contexts. And I love all things Mexican – these look excellent! Thanks, Ellen! I agree, I think sweet potato casserole can be just a little too sweet for me when the potatoes themselves are sweetened with brown sugar or honey and + there’s the sweet crumbly topping or marshmallows on top. These look amazing, girl! And they would be perfect with a dollop of guac on top too! I’m actually not a huge marshmallow person in general so I’m with you, Kristy! You just need to get yourself some Japanese sweets! Orange yams are terrible, the other more dense sweet potatoes like Japanese are 100000x better and different! I love Japanese sweet potatoes and usually eat a few every week! Stuffed sweet potatoes are so simple yet they are the best. I love stuffing them with whatever protein I have on hand. So great that while they’re baking, you can get everything else ready. 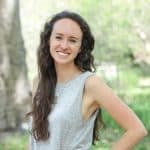 Fast & easy recipes are always my goal! Thanks for the kind words, Sydney!